More than seven months ago, I was one of those people who was online in a virtual waiting room, waiting for my turn to purchase tickets to the musical, Hamilton, which was coming to the Orpheum Theater in San Francisco. Tickets went on sale starting at 10 am. Before 10 am, you could log on and join the virtual waiting room. At 10 am, everyone who was in the waiting room was randomly assigned a place in “line” to purchase tickets. My random number was in the 45000s. Yes, there were more than 45,000 people ahead of me to purchase tickets. Each person could only purchase up to 6 tickets. During the 5 hours and 46 minutes that I waited in line/online, I looked up how many seats were in the theater, calculated how many performances there would be multiplied by how many seats divided by 6 tickets per person to figure out if being #45xxx would be good enough to still have tickets available by the time it was my turn. What? I’m a numbers nerd and it helped kill 5 minutes. Fortunately, being number 45,000-something was good enough to still get tickets. Although by the time I got in and was able to scan the available dates and the seats that were left, I had to book a date almost at the end of their SF run and could only get 4 seats together in the mezzanine and 2 in the orchestra, not 6 seated together. No problem. I invited 3 other friends for the cost of the tickets and sold the 2 orchestra seats to another friend. We were going to Hamilton. But first, on show night, we went to dinner….of course. My friend Jenny was the most familiar with San Francisco since she’d lived there for years so we went with her recommendation of Montesacro Pinseria-Enoteca, which was near the Orpheum Theater. Pinseria, as I found out later, isn’t pizza but is a Mediterranean flatbread with toppings just like a pizza. Most people probably wouldn’t make the distinction. What I cared about was that it be good and it was. As our server explained to us, Montesacro focuses on healthy ingredients. As an aside, they don’t serve sodas since it doesn’t fit with their healthy eating vision or their focus on using ingredients that are organic and sustainable. That was okay by me because I was focused on the pinseria. I ordered the Maranella which was flatbread with spicy sausage, broccolini, and burrata. I know, why broccolini, given my aversion to vegetables? Ah, but you’re talking to the champion picky eater who can pick anything I don’t want out of my food. Of course, later I realized I could’ve just asked them to omit the broccolini entirely but our wait person was so earnest about how they use fresh, healthy ingredients locally sourced as much as possible that it didn’t occur to me to counter her spiel with “I’ll take the Maranella without the fresh, organic, locally sourced broccolini.” I might have even eaten a spear or two in an attempt to add some healthy to my bites. As my friends bluntly told me, “it won’t kill you.” Humph. So they say. The flatbread was really good as was the whole pinseria. It’s best eaten right away while it’s still warm as it did have a tendency to get a little chewy at the ends as it cooled and it also got a bit soggy in the middle. I couldn’t finish the whole thing (had to leave room for dessert, ‘kay?) 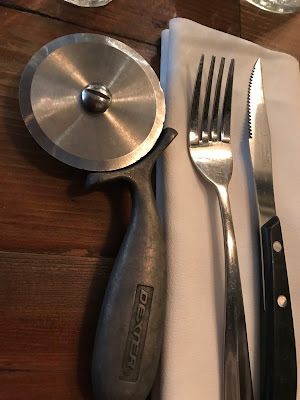 as it was a generous serving but I liked what I had, especially using the uber-cool all-metal pizza cutter that came with each of our pinserias. As I was wont to do, I had checked out the menu online so I already knew what I wanted for dessert. The menu called it a small pinseria stuffed with pistachio Nutella. I had a vision of a mini-calzone with Nutella lava spilling out sprinkled with toasted chopped pistachios. The real thing was not quite close to my vision. The pistachio showed up as some form of green paste that was mixed in with the Nutella. It wasn’t “stuffed” so much as “spread on the inside” like peanut butter or jelly. It was lukewarm when it arrived and for texture purposes, I would’ve preferred it served just a bit warmer as the flatbread was best when it was warm to hot. The actual pistachio-nutella “paste” wasn’t that appetizing to look at. There’s something off-putting about green paste. Which was unfortunate as the taste itself was pretty good. I don’t know if that was due to the pistachio paste but it really drew out the flavor of Nutella. If I had to tweak this dessert, I would make it more like my vision of a thin Calzone stuffed with Nutella and garnished with pistachios. And I say “thin” because I was already feeling kinda bread-y full from the pinseria. The other dessert we shared was the chocolate chili mousse. I’m not a believer in spiking my chocolate with spices or fruit. I had a tiny, tiny taste of the mousse and the chili wasn’t very prevalent. That means I couldn’t really taste it from the tiny tip-of-the-spoon-ful I had. A light, airy mousse is probably a better topper to a pinseria but I’m glad I tried the pistachio-Nutella pinseria, even if it wouldn’t make my top 10 list of dessert beauty contestants. After dinner, of course, it was showtime. I won’t go into raptures about Hamilton here….no, wait, that’s a lie. The show was excellent. It was pretty hyped up so I was afraid my expectations would be too high and I’d be disappointed but that wasn’t the case. I had actually read the 800-page+tome by Ron Chernow (yes, I’m a girl-nerd) so I had a good idea of Hamilton’s life story and could follow the musical pretty well. I expected great voices and I got them. I was particularly expressed by the purity and beauty of the cast’s voices, especially by the female leads (Eliza Hamilton!!). I expected an edgy musical score and I got that too. Hamilton, the birth of our nation and rap? Not your usual combination. It was brilliant. King George was an unexpected riot (cue much hysterical laughing). Props to Lin-Manuel Miranda for his vision and creativity in conceiving and executing such a score and such a show. For me, it was worth the 7+ month wait.